QMSS™ (QSound Multi-Speaker System) is QSound Labs’ innovative surround synthesis algorithm that creates stunning multi-channel output from plain stereo content. Although multi-speaker surround systems are increasingly common in the home, the relatively small amount of multi-channel music content available today often means the consumer ends up listening to plain stereo instead of taking full advantage of their hardware. To maximize the consumer’s enjoyment of surround sound systems, QSound developed the QMSS stereo-to-surround synthesis algorithm. By using the inherent left/right pan information in a stereo signal to “steer” image components to multiple speakers, QMSS creates stunning surround effects with distinctly different outputs for 4 or 5 full-range speakers, and also derives a discrete subwoofer channel. QMSS can even create a remarkable synthesized surround image from monophonic content. Unlike other approaches, which merely copy the stereo signal in the rear channels, or use budget reverberation in the rear to provide some contrast with the front, QMSS generates a unique signal for each channel, rendering distinct and dramatic positioning. 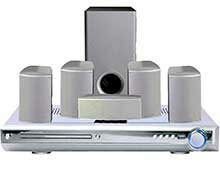 As a result, the original stereo image is effectively wrapped around the listener, without sacrificing clarity or detail.